Sir Henry Campbell-Bannerman, GCB, lived from 7 September 1836 to 22 April 1908. He was a Liberal Party politician who served as Prime Minister of the United Kingdom from 5 December 1905 until 3 April 1908. The wider picture in Scotland at the time is set out in our Historical Timeline. Henry Campbell was born at Kelvinside House in Glasgow. 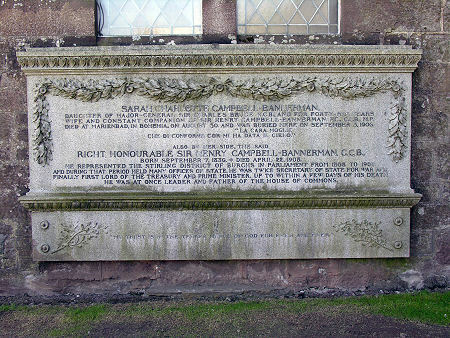 He was the youngest of the six children of Sir James Campbell, Lord Provost of Glasgow, and his wife Janet Bannerman. Campbell was educated at the High School of Glasgow before going on to study at the University of Glasgow and Trinity College, Cambridge. He became a partner in the family drapery firm, J.& W. Campbell & Co, in 1860. In the same year he married Sarah Charlotte Bruce, a shrewd, intelligent and cultured woman who did much to help guide her husband's future political success. In 1868, Campbell was elected to be Member of Parliament for Stirling Burghs, a seat he continued to represent until his death. He was appointed to the first of a series of junior ministerial posts in 1871. In the same year he changed his surname from Campbell to Campbell-Bannerman, a condition in his maternal uncle's will that secured his inheritance of his uncle's estates in Kent. In 1884 Campbell-Bannerman became a member of Gladstone's Cabinet as Chief Secretary for Ireland. He later served as Secretary of State for War in 1886 and from 1892 to 1895. He gained his knighthood for persuading Queen Victoria's cousin, the Duke of Cambridge, to resign as Commander-in-Chief of the Army. In 1898, Campbell-Bannerman became leader of the Liberal Party. On 5 December 1905 he became First Lord of the Treasury, five days later being the first UK politician ever to officially adopt the title "Prime Minister". During his short tenure, Campbell-Bannerman oversaw the introduction of sick pay and old age pensions. He fell seriously ill in early 1908, and resigned as Prime Minister on 3 April. By now his health was so poor that he continued to live in the Prime Minister's official residence at 10 Downing Street until his death on 22 April 1908. Since 1887 Sir Henry and Lady Campbell-Bannerman had maintained a Scottish residence at Belmont Castle, on the south side of Meigle in Perthshire. He was buried in nearby Meigle Churchyard where he is commemorated by a plaque on the exterior wall of the church.